As chief judge during the first years of the reign of the judges, Alma the Younger addressed difficulties such as the execution of Nehor, the revolt of Amlici, and a postwar economic slump. In the eighth year of his term, Alma resigned from office and devoted all of his energy to preaching the gospel to his people, "to stir them up in remembrance of their duty, and . . . pull down, by the word of God, all the pride and craftiness and all the contentions which were among his people" (Alma 4:19). 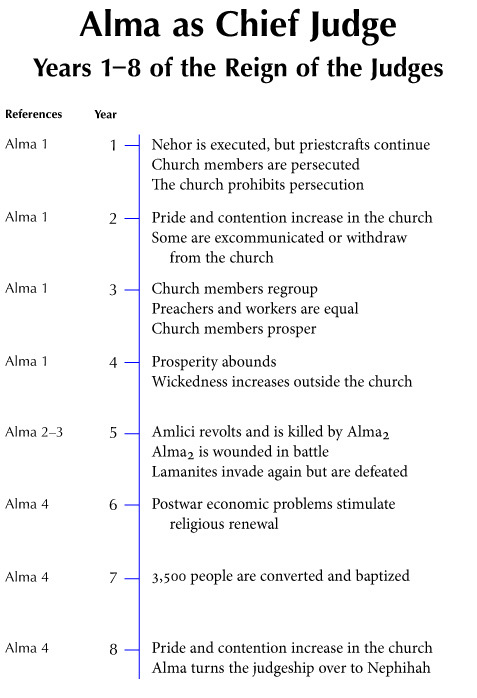 Although Alma resigned from the office of chief judge, he retained the office of high priest, thereby separating the political and religious spheres of influence. This chart outlines the main events for years 1–8 of the reign of the judges (91–83 B.C. ).